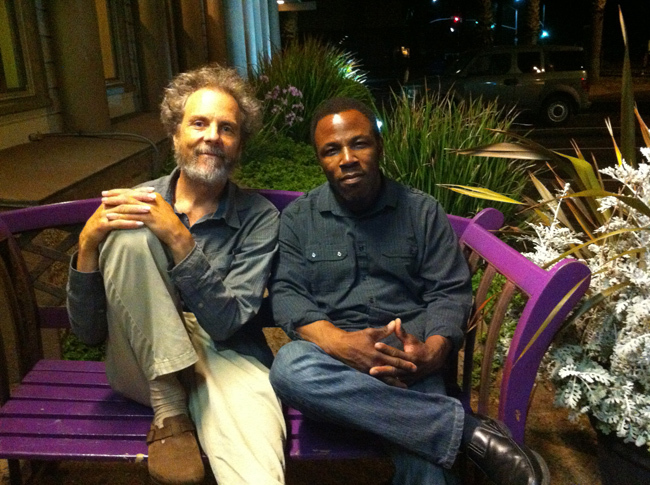 Greetings Good People, Stef and I were out to dinner with friends last night and we started to talk about music. Big surprise! 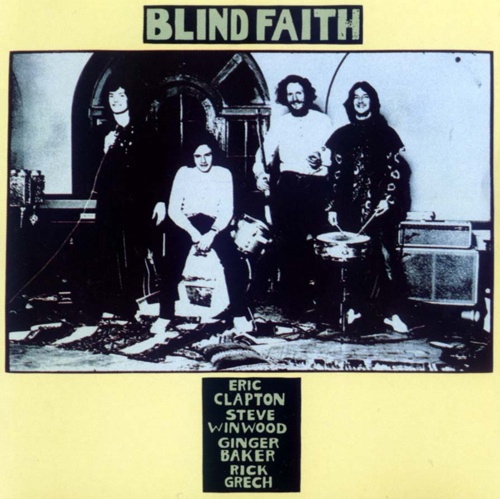 We got into a cool loop beginning with English rock bands and this led us to the semi-obscure late 1960’s recording of Blind Faith. Do you know that record? They only did one and then later disbanded. It was sort of a Cream/Traffic offshoot with Eric Clapton, Eric Clapton, Stevie Windwood, and Rick Grech. It was amazing music then and it still works on my old man jazz ears now. I love this music! I’m listening now to “Do What You Like” and it’s an epic 5/4 meter jam with Eric playing super melodic and reverb washes flowing in and out. Ginger is taking a loonnnnnngggg drum solo and the rest of the band is chanting “do what you like” in the background. Rock on! I’m thinking sometime down the way we’ll kick start a jazz mash-up of some of this music. Watch out! These guys ripped it up! The last two weeks were as busy as it gets for me on the gig front. We played a bunch of concerts each requiring their own unique body of music. Plus, loads of miles driven to deliver the goods. Thank goodness Bob Magnusson was in the drivers seat on our way back from our L.A. Vitello’s hit. It was the end of the marathon for me and all I could do was check into full on car slumber mode. Vertical zzzz’s! 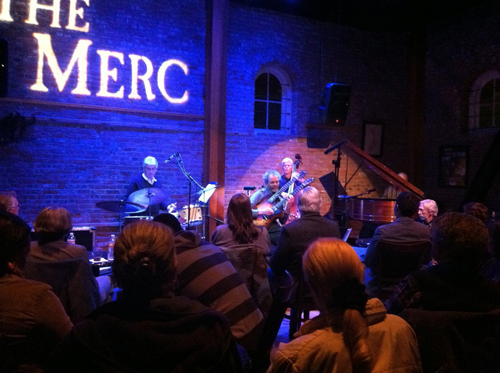 At the Merc with Road Work Ahead. And this week is pure heaven! I’m balancing my time completing two performance grants due at the end of the week with super long surf sessions enveloped in some of the most spectacular sunny days a California winter could dream up. It’s magic out there folks and today is a repeat performance. I’ll wrap up the office chores soon and then I’ll see you out there this afternoon! Up for tomorrow night I’ll return to my favorite Roxy Restaurant in downtown Encinitas for an evening of solo guitar explorations. I’ve been absent for a month and I’m thrilled to return to check in with the gang. Hope to see you there! A couple of months back Leonard Patton and I played a concert at Mesa College and afterwards, while saying hi to some of the students, I met a gal from Brazil who is currently at Mesa studying music. I’m really into Brazilian music and to learn more about the sound and the culture is a real interest. 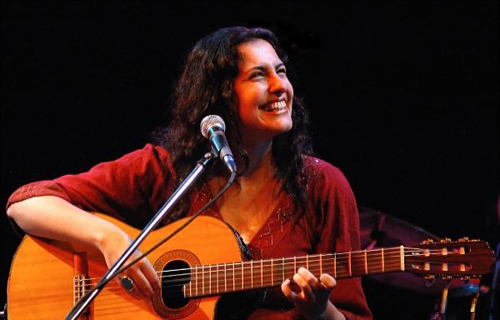 Her name is Dani Lasalvia and in a very understated and humble way, she gave me her CD that she recorded in Brazil. There’s something special about someone not playing up their accomplishments, not advertising their achievements but rather, letting them unfold naturally. This is Dani’s way. The good news is that I took her CD home, gave it a spin and was knocked out! This girl can sing and I love her compositions too. She plays beautiful guitar and the vibe of the music is just what you’d want. I’m so happy that a Ki’s gig came along so that we’d have an excuse to pull together a couple of sets of music. It’s happening this week and in the loop with Dani and me is my brother Tripp on sax and percussionist Julien Canthelm. It’ll be a night of bossa nova, samba, Brazilian folk and 2 Beatles songs sung with Dani’s thick Porteguese/English accent. Check it out! Last up on Saturday night it’ll be a Dizzy’s hit with my favorite Leonard on vocals singing jazz spins on Beatles, Stevie Wonder, Hendrix, Pat Metheny, James Taylor and more. We’ve also discussed the idea of making up a few tunes on the spot with the audience (you) supplying the song title and maybe a few key lyrics. I’m not entirely sure how well we’ll pull this off but it’ll be fun trying. I’ve seen Leonard cook at free-styling lyrics and I too know how make up tunes on the spot. But the iffy element here is can we both do this at the same time without crashing and burning? We’ll see! Peter and Leonard cooking up a game plan to invent songs on the spot.